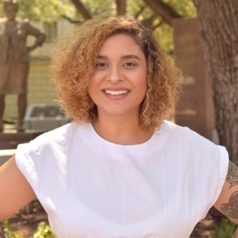 Lauren Lluveras is a Postdoctoral Fellow at the Institute for Urban Policy Research and Analysis, housed at the University of Texas at Austin. In previous positions, Lauren was an equity and inclusion specialist at the Office for Minority Health Engagement and Statistics, and clerked for Texas Advocacy Project, Texas Rio Grande Legal Aid and the Center for Legal and Social Justice at St. Mary's University, School of Law. Lauren holds a Juris Doctor from St. Mary's University and a Bachelor of Arts from Texas A&M University.